I've been listening to The Selfish Gene by Richard Dawkins. First published in 1976 (the 2006 version has additional material and notes), this book was a real game-changer in the field of social biology. Dawkins' premise is that the fundamental actors in evolution by natural selection are not individual organisms, but the genes carried within their bodies. He argues against the common belief that groups of individuals behave in certain ways "for the good of the species", instead describing animals' bodies as "survival machines" that allow genes, the "immortal replicators", to continue to exist. Whenever we see behavior by individuals or groups of organisms in nature that appears "altruistic", it can be explained by a gene's selfish "desire" to survive. All of this is illustrated via detailed examples while steering clear of complex math formulas and remaining lively and engaging. It's actually mind-blowing to think about: we individuals are temporary, but genes (and we're not speaking of an individual gene carried in an individual body, but of all copies of that gene that exist everywhere on Earth) can live on forever. I finished Night Has a Thousand Eyes by Cornell Woolrich, a psychological noir tale about a man who can see the future, and the tension, dread and madness his predictions bring to the people they involve. Not only is it super dark and intense but the writing is so vivid, I felt like I was watching a movie (in glorious black and white of course). I also finished Spark by John Twelve Hawks, a science fiction story with a hired killer protagonist who is brain-damaged, feels no fear, and believes he is dead. It was a really good read; I've never encountered a main character like that before. The first-person perspective was fascinating, and the sometimes flat, utilitarian prose that would occasionally flare into beauty felt entirely appropriate. It was also quite a philosophical book, bringing up questions about who is really alive, and who is human. I've reached 60,000 words on The Free City. I feel like the more I write on this, the more momentum I gain--so I'm really hoping I can keep it up despite the approach of winter (and the resulting inaccessibility of the Sekrit Picnic Table). The hubs and I went up to "our" cabin in northern Wisconsin again for a few days. It was completely beautiful there with the fall colors in full swing, and being the off season, there was a lonely, deserted feel to the area which we thoroughly enjoyed. (I imagine that in the middle of summer it's probably annoying as hell with herds of jet-skis and screaming children.) We did some hiking and antique shopping, as well as reading a lot of books and playing a few games of Mansions of Madness with a fire going in the fireplace and nips of whiskey at hand. 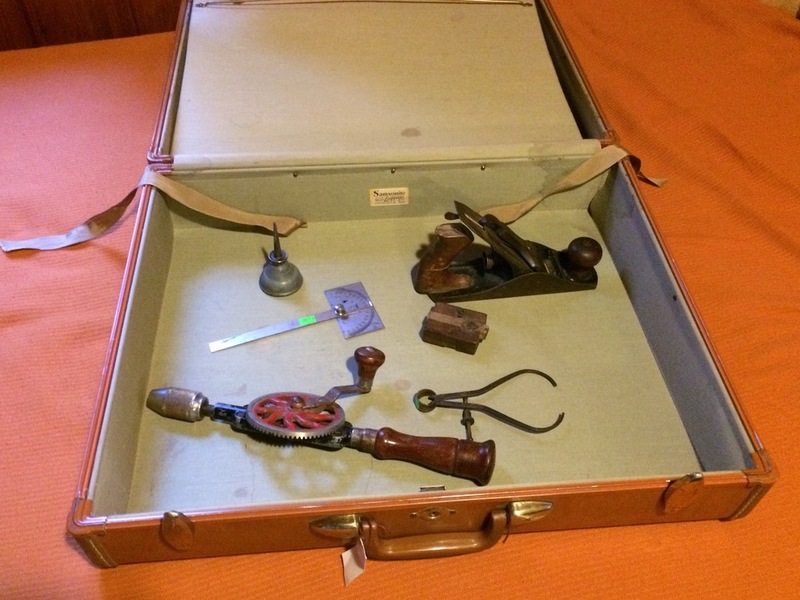 D's thrift store finds (including the suitcase). 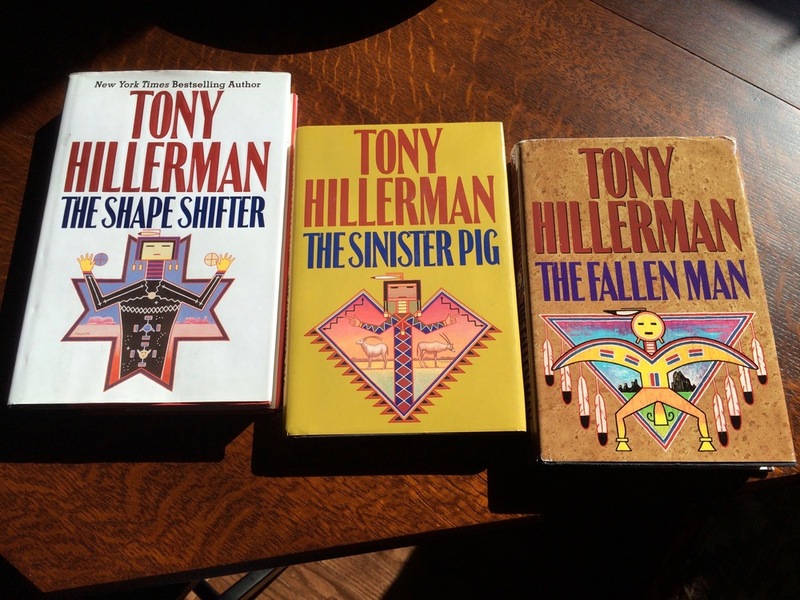 My thrift store loot: a few more Tony Hillerman books to add to my collection. They have the coolest covers! Cosy fireplace in our cabin. Halloween! Look at my awesome pumpkin! Being that Halloween was on a weekend this year, we actually got more than 1 or 2 trick-or-treaters. Yay! Also... I recently started drawing a (very rudimentary) comic strip called Time Traveler. Which you can read here, if you have nothing better to do. I'm talking about stick figures. It's about a guy who's a time traveler. Well, sort of. It's fun drawing it because it doesn't seem to distract me from my current writing work in progress, the way writing another story at the same time would. Must use a slightly different part of the ol' brain, or something.